As Parliament debates introducing proxy voting for MPs, a new pamphlet shows reform of how the Commons works is long overdue. Pictured: Tory MP Christopher Chope sparked outrage in June when he blocked a bill to ban ‘upskirting’ with just one word. Speaker’s House – among the grandest buildings of the Parliamentary estate – was a strangely fitting venue for the launch of the Fabian Society’s report on reforming the Palace of Westminster, New Brooms, on Wednesday. But it reflected the curious dynamic within Parliament: progressive MPs pushing for change, within an incredibly archaic institution. Several recent stories have their calls for reform particularly pertinent. In June, the public learnt of one particularly crude method used to stifle backbench bills. 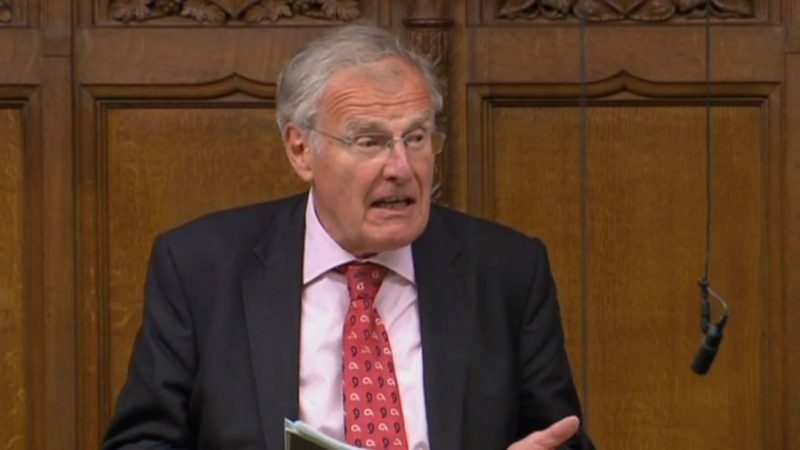 Sir Christopher Chope – a Tory backbencher himself – caused outrage when he managed to block a planned bill to make ‘upskirting’ illegal – simply by saying ‘Object’. The Voyeurism (Offences) Bill would make it illegal for offenders to take a picture under someone’s clothing without their consent. Yet it fell on the basis of one MP. And while there are hopes the plans will be revived – with government support – the scandal shone a light on just how out of date much Commons procedure is. Then in July, Naz Shah was forced to take a taxi from her Bradford constituency despite being in hospital since last Friday with serious nerve pain. As her colleague Emma Dent Coad noted, Shah had to “defy her doctor’s advice…and physically get through the voting lobby in a wheelchair, carrying a sick bucket and dosed up on morphine.” All because the Conservative whips refused to honour the ‘nodding through’ process – one which normally allows ill MPs to miss votes if they can get themselves to the Parliamentary estate. The broken system can have profound consequences. In 1979, Callaghan’s Labour government fell – by one vote – when Labour MP Alfred Broughton, who was dying of heart failure, was unable to return for the confidence vote. Another colleague, Laura Pidcock, was forced to go through the lobby despite being heavily pregnant and suffering with serious back pain. And the Lib Dem’s Jo Swinson discovered that her ‘pair’ – the agreement where a pair of opposing-party MPs do not vote if one is incapable of voting – was broken, despite assurances to the contrary. Theresa May insisted it was an “honest mistake” – but it was a crux Brexit division, won by just a few votes for the government – and there were calls for the Tory whip to resign. The row matters for diversity as much as faith in democracy – Swinson is a new mum. Calls for change are now deafening within the walls of Westminster. The new Fabian report highlights these issues and many others – improving access for disabled MPs, changing daily prayers to a ‘thought for the day’ to reflect the fact that many MPs aren’t Christian. “Politics too often feels toxic, and Parliament gridlocked. There’s too much process and not enough product,” says Labour MP and New Brooms editor James Frith. For Ellie Reeves – MP for Lewisham West and Penge – Parliament has begun to adapt but not nearly as quick as it should. Another welcome reform of recent years is the ability for MPs to take their kids through the voting lobby. Reeves’ son often asks: “Mum are we going voting tonight..I want to vote!” (That keenness was the source of some amusement when he wanted to vote with another kid from the nursery recently – only to find it was impossible: the child’s parent was a Tory). But there is more to do – the huge waiting times to vote are ‘inefficient’, she Reeves says. Often, divisions can mean up to an hour of standing around. Shadow Leader of the House, Valerie Vaz, says Labour are committed to change, with the party hoping to take some of the steps outlined in the Fabian report forward in the manifesto. Much can be done now however, with the backing of Commons authorities. Shah praised John Bercow as “such a reforming Speaker”. “You’ve seen the attacks on him” – Bercow has faced allegations of bullying his own staff – “but he’s made it so easy for women and BME people to come in and take our roles,” she claims. While easy to denigrate rule changes as ‘naval gazing’, how Parliament works (or doesn’t) matters for representation and who is able to speak up for us. “We are at the confluence of tradition and modernisation,” Shah says. Striking a balance will be a tough job. When Parliament debates the issue of parental leave today, Leader of the House Andrea Leadsom says she will commit to introducing a system of proxy voting to allow this to be available to MPs. Reform moves gradually in the Commons. But thankfully, change is not only on the agenda – it’s finally happening. Read the ‘New Brooms’ report.